Background/Aims: This study aimed to explore the effect of circular RNA ARHGAP26 (circ-ARHGAP26) on cell proliferation and apoptosis in gastric cancer (GC) cell lines. Materials and Methods: Human GC cell lines including HGC-27, AGS, SGC-7901, BGC-823, NCI-N87 and human normal gastric mucosal cells GSE-1 were cultured. The circ-ARHGAP26 expression was determined by quantitative polymerase chain reaction assay. 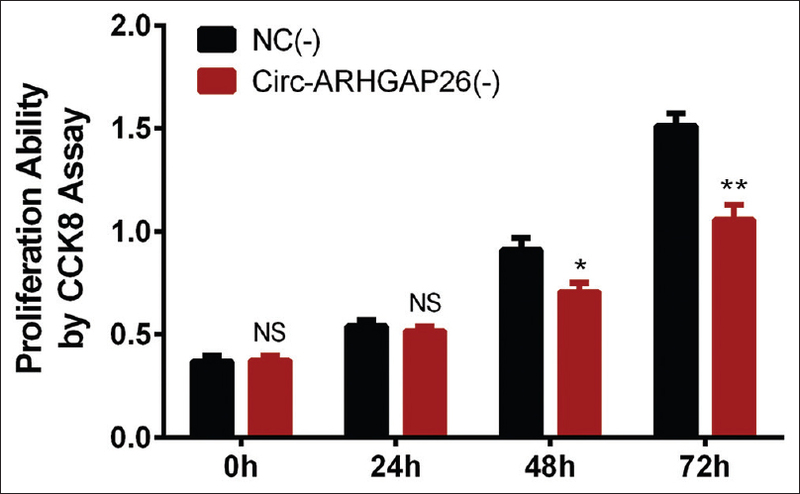 Blank inhibitor and circ-ARHGAP26 inhibitor plasmids were transfected into HGC-27 or AGS cells as NC (-) and circ-ARHGAP26(-) groups. Counting Kit-8 (CCK-8) and Annexin V (AV)/propidium iodide (PI) were conducted to evaluate cell proliferation and cell apoptosis, respectively. Western blot was performed to determine the expressions of apoptotic markers (C-Caspase3 and Bcl-2). Results: The circ-ARHGAP26 expression was elevated in HGC-27 (P < 0.001), AGS (P < 0.001), SGC-7901 (P < 0.01), BGC-823 (P < 0.05) and NCI-N87 (P < 0.05) GC cell lines compared to GSE-1 cells. In HGC-27 cells, CCK8 assay revealed that cell proliferation was decreased at 48 h (P < 0.05) and 72 h (P < 0.01), while AV/PI assay disclosed that cell apoptosis rate was increased at 72 h in circ-ARHGAP26 (-) group compared to NC (-) group (P < 0.01). Western blot assay also illuminated that apoptotic marker C-Caspase 3 was raised, while anti-apoptotic marker Bcl-2 was reduced at 72 h in circ-ARHGAP26 (-) group compared to NC (-) group. In addition, further validation in AGS cells also exhibited that cells proliferation was repressed, while apoptosis was enhanced in circ-ARHGAP26 (-) group compared to NC (-) group. Conclusion: The circ-ARHGAP26 is over-expressed and its downregulation inhibits cell proliferation and promotes cells apoptosis in GC cells. Gastric cancer (GC) is the fifth most common cancer and the third most common cause of cancer deaths, resulting in 961,600 new cases and 723,000 deaths during 2012, worldwide. In addition, it has been considered as the most common malignancy in China with 679,100 new cases and 498,000 deaths in 2015.,,,, The major risk factors of GC consist of host factors (such as inherited or acquired factors) as well as environmental factors (including H Pylori infection, smoking, alcohol, salt and obesity)., Although advances in image technology, surgical strategies and medicine therapies have been realized during these years, improving survival is still a huge challenge in GC patients, whose 5-year overall survival ranges from 12 to 98% according to the malignant degree., Thus, it is urgent to explore novel treatment targets to improve prognosis in GC patients. Circular RNA (circRNA) is a kind of endogenous noncoding RNA with covalently closed continuous loop, and it acts as the sponge for microRNA (miRNA) to regulate gene expressions., circ-ARHGAP26, also known as circ_0074362, locates on Chr5 from site 142894237 to 142932125 with length of 37888 bp in gastric tissue or cells., It is reported that circ-ARHGAP26 expression is upregulated in GC tissues compared to paired adjacent normal tissues by microarray detection, while another study shows the decreased expression of circ-ARHGAP26 in GC tissues., These previous studies indicate that the role of circ-ARHGAP26 in GC is still controversial. Thus, we conducted this study to investigate the effect of circ-ARHGAP26 on cell proliferation and apoptosis in GC cell lines. Human GC cell lines including HGC-27, AGS, SGC-7901, BGC-823, NCI-N87 and human normal gastric mucosal cells GSE-1 were purchased from Chinese Academy of Sciences Affiliated Cell Resource Center of Shanghai Institute of Life Sciences (Shanghai, China). HGC-27, BGC-823, SGC-7901 and GSE-1 cells were cultured in 90% RPMI 1640 medium (Sigma-Aldrich, USA) supplemented with 10% FBS (Gibco, USA); AGS cells were cultured in 90% F12K medium (Sigma-Aldrich, USA) supplemented with 10% FBS (Gibco, USA); NCI-N87 cells were cultured in 88% RPMI 1640 medium (Sigma-Aldrich, USA) supplemented with 10% FBS (Gibco, USA), 1% glutamax (Invitrogen, USA), and 1% sodium pyruvate (Invitrogen, USA). All these cell lines were incubated in a humidified incubator under 95% air and 5% CO2 condition at 37°C. Circ-ARHGAP26 expression was determined by quantitative polymerase chain reaction (qPCR) assay in human GC cell lines including HGC-27, AGS, SGC-7901, BGC-823, NCI-N87 as well as human normal gastric mucosal cells GSE-1. Blank inhibitor and circ-ARHGAP26 inhibitor plasmids (Constructed by Shanghai Qeejen Bio-tech Institution, China) that contain sequence expanding the junction site of circ-ARHGAP26 were transfected into HGC-27 cells as NC (-) and circ-ARHGAP26(-) groups, so that the levels of specific circ-ARHGAP26 could be reduced. Subsequently, qPCR assay was performed to assess the circ-ARHGAP26 expression at 24 h; CCK-8 assay was performed to detect the cells' proliferation ability at 0 h, 24 h, 48 h and 72 h; AV/PI assay was performed to measure the cell apoptosis rate at 72 h; In addition, Western blot was performed to determine the expressions of apoptotic markers (C-Caspase3 and Bcl-2). To further validate the effect of circ-ARHGAP26 downregulation on GC cell proliferation and apoptosis, we transfected blank inhibitor and circ-ARHGAP26 inhibitor plasmids into another human GC cells (AGS cells); qPCR assay was performed to assess the circ-ARHGAP26 expression at 24 h; CCK-8 assay was performed to detect the cell proliferation ability at 0 h, 24 h, 48 h and 72 h; and AV/PI assay was performed to measure the cell apoptosis rate at 72 h in each group. circ-ARHGAP26 expressions were assessed by qPCR. The procedure of qPCR was as follows: (1) total RNA was extracted from cells by TRIzol reagent (Invitrogen, USA); (2) 1 μg total RNA from each sample was used for reverse transcription to cDNA by PrimeScript™ RT reagent Kit (TAKARA, Japan); (3) cDNA was applied to perform qPCR by SYBR® Premix DimerEraser™ (TaKaRa, Japan), and the amplification of qPCR was carried out under 95°C for 3 min, 40 cycles of 95°C for 5 s, 61°C for 10 s, and 72°C for 30 s; (4) qPCR results were calculated by 2−ΔΔCt method, and glyceraldehyde-3-phosphate dehydrogenase (GAPDH) was served as the internal reference. The sequence of circ-ARHGAP26 in gastric cells was retrieved from Tissue-Specific circRNA Database (TSCD) on gb.whu.edu.cn/TSCD/with entry number chr5: 142894237 | 142932125. The primers were designed for this work, and the sequences of circ-ARHGAP26 and GAPDH were as follows: circ_0074362 Forward primer: 5′-AACAGACTCCATTGAGAAGAGGTT-3′, circ_0074362 Reverse primer: 5′-GCCTCCTGAAGCTGAGATTCTT-3′, GAPDH forward primer: 5′-TGACCACAGTCCATGCCATCAC-3′, GAPDH reverse primer: 5′- GCCTGCTTCA CCACCTTCTTGA-3′. Culture media of cells were discarded and cells were washed by PBS, and then added with 10 μL CCK8 (Thermo, USA) and 90 μL serum free medium. Subsequently, cells were incubated for 2 h under the condition of 95% air plus 5% CO2 at 37°C. Microplate reader (BioTek, USA) was applied to detect the optical density (OD) value at 450 nm, which represented cell proliferation. Cells were digested by 0.25% Tyrisin for 5 min, and then trypsinization was terminated with serum free medium. After centrifugation (1800 rpm, 3 min), the supernatant was discarded, and cells were washed by PBS and prepared as 100 μL suspension. 2 μL AV (Invitrogen, USA) was added into cell suspension in darkness, followed by incubation at 37°C for 15 min, and subsequently, 1 μL PI (Invitrogen, USA) was added. The apoptosis rate was evaluated by flow cytometry (FCM) (Beckman, USA). Each group of cells were added with 1 mL radio-immunoprecipitation assay (RIPA) buffer (Sigma, USA) on ice, and then centrifuged at 16000 rpm under freezing condition. The supernatant was obtained and the concentration of total protein was measured by bicinchoninic acid kit (Pierce Biotechnology, Rockford, IL, USA). After thermal denaturation, 20 μg protein samples were subjected to sodium dodecyl sulfate polyacrylamide gel electrophoresis (Thermo, USA) and transfected to polyvinylidene fluoride membranes (Millipore, Bedford, USA). Subsequently, membranes were blocked with 5% skimmed milk and incubated with the corresponding primary antibody overnight at 4°C, and further, incubated with the appropriate biotin-conjugated secondary antibody at room temperature. Then, the bands were visualized with an enhanced chemiluminescence kit (Millipore, Bedford, USA) and exposure to X-ray film, and Image J (National Institutes of Health, USA) was used to analyze the gray scale of the band intensity. Three experiments of Western blot were performed. Statistical analysis was performed by SPSS 22.0 software (IBM, USA), and statistical images were made by Graphpa Prism 6.01 (GraphPad Software Inc, USA). Data were mainly presented as mean ± standard error. Comparison between two groups was determined by t test. P < 0.05 was considered significant. 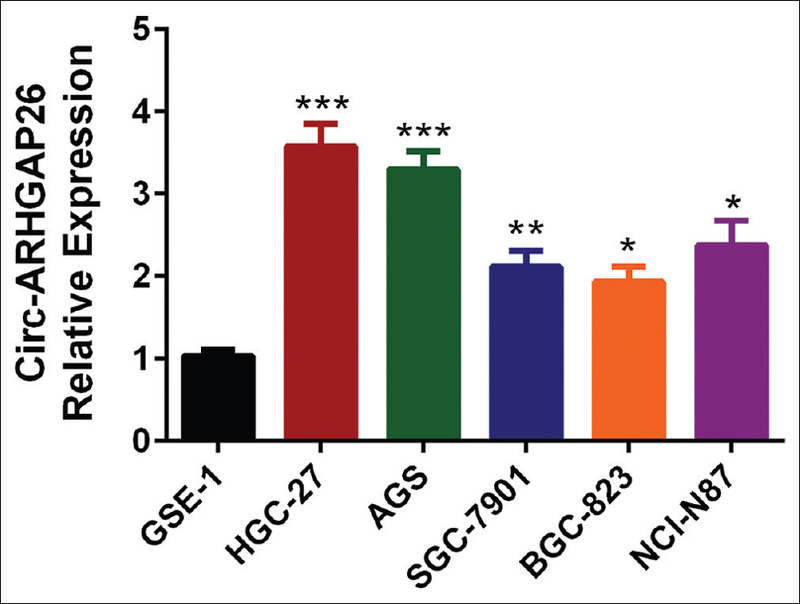 As shown in [Figure 1], circ-ARHGAP26 expression was elevated in HGC-27 (P < 0.001), AGS (P < 0.001), SGC-7901 (P < 0.01), BGC-823 (P < 0.05) and NCI-N87 (P < 0.05) GC cell lines compared to normal gastric epithelial cells (GSE-1), and the numerically two highest circ-ARHGAP26 expressions were observed in HGC-27 cells and AGS cells. Thus, they were chosen for the subsequent experiments to further explore the function of circ-ARHGAP26 on regulating GC cell proliferation and apoptosis. 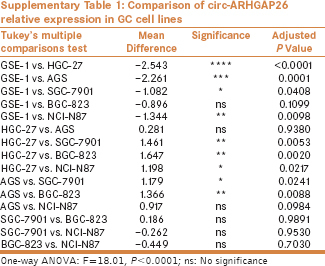 Moreover, one-way analysis of variance (ANOVA) was performed to compare the circ-ARHGAP26 expression between different groups, which displayed that circ-ARHGAP26 expression was higher in HGC-27 (P < 0.0001), AGS (P = 0.0001), SGC-7901 (P = 0.0408) and NCI-N87 (P = 0.0098) cells compared to GSE-1 cells [Supplementary Table 1 [Additional file 1]]. After transfection of blank inhibitor plasmid and circ-ARHGAP26 inhibitor plasmid in HGC-27 cells for 24 h, circ-ARHGAP26 expression was assessed by qPCR, which displayed that circ-ARHGAP26 expression was reduced in circ-ARHGAP26 (-) group compared to NC (-) group [Figure 2] (P < 0.001). 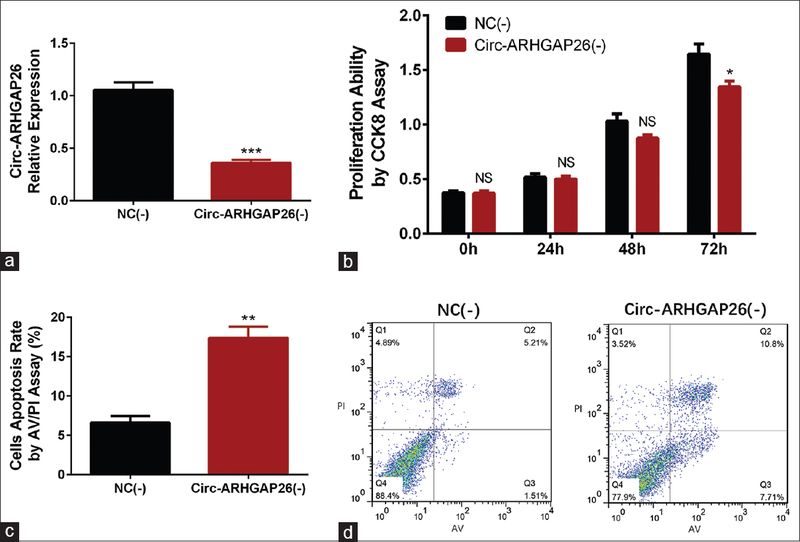 Cells proliferation was decreased in circ-ARHGAP26 (-) group compared to NC (-) group at 48 h (P < 0.05) and 72 h (P < 0.01), suggesting that downregulation of circ-ARHGAP26 inhibited cell proliferation in HCG-27 cells [Figure 3]. Furthermore, repeated measure two-way ANOVA with Sidak's multiple comparison test was conducted, which disclosed that interaction between intervention and time has significant effect on cell proliferation rate (F = 22.6, P < 0.0001), in addition, the time effect was also significant (F = 323, P < 0.0001) [Supplementary Table 2 [Additional file 2]]. Cell apoptosis rate was higher in circ-ARHGAP26 (-) group compared to NC (-) group at 72 h (P < 0.01) [Figure 4]a and [Figure 4]b. 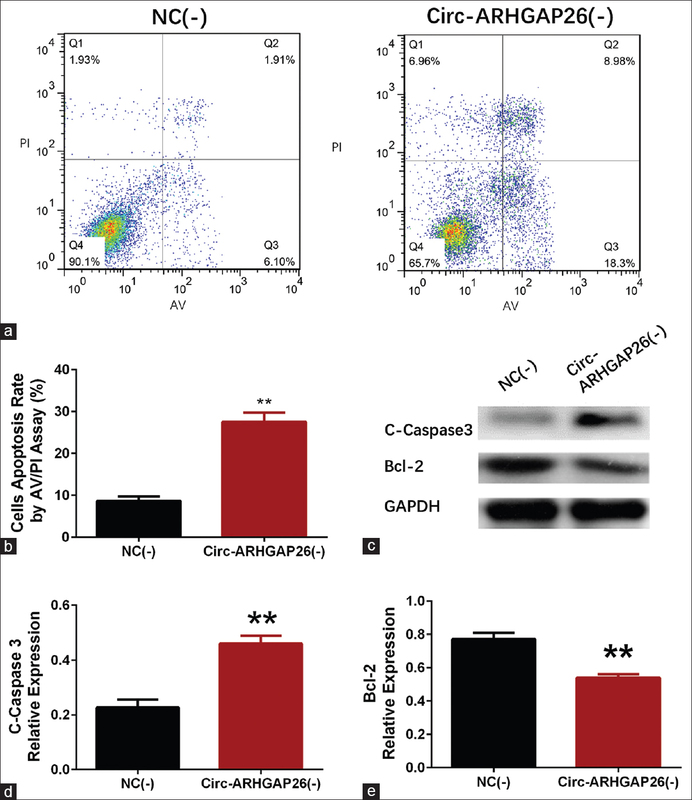 As exhibited in [Figure 4]c, expression of C-Caspase3 was increased in circ-ARHGAP26 (-) group compared with NC (-) group, while the expression of anti-apoptotic protein Bcl-2 was reduced in circ-ARHGAP26 (-) group compared with NC (-) group, in addition, analysis of the gray scales was performed [Figure 4]d and [Figure 4]e. These results suggest that circ-ARHGAP26 downregulation enhances cell apoptosis in HGC-27 cells. To validate the effect of circ-ARHGAP26 downregulation on cell proliferation and cell apoptosis, qPCR assay, CCK-8 assay and AV/PI assay were conducted again in AGS cells [Figure 5]. 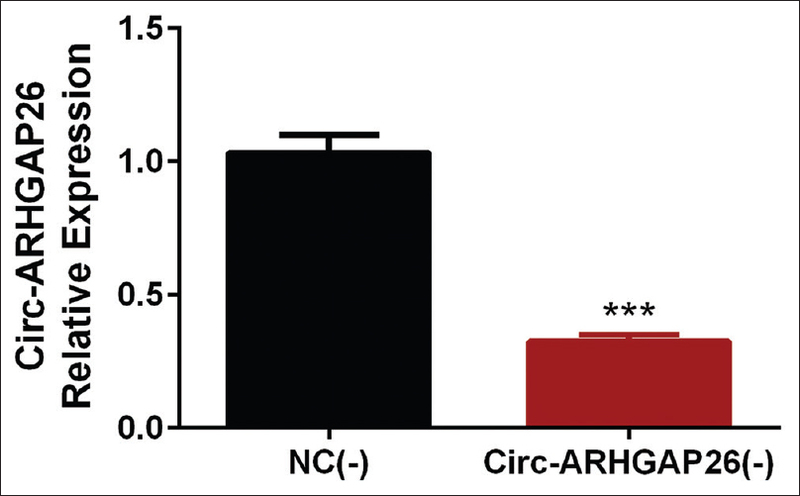 In AGS cell line, the circ-ARHGAP26 expression was lower in circ-ARHGAP26 (-) group than that in NC (-) group [Figure 5]a (P < 0.01). Moreover, compared with NC (-) group, cells proliferation was decreased [Figure 5]b (P < 0.05), meanwhile, repeated measure two-way ANOVA with Sidak's multiple comparison test [Supplementary Table 3 [Additional file 3]] was conducted, which revealed that interaction between intervention effects and time effects (F = 13, P= 0.0004) was significant. In addition, the time effect (F = 697, P < 0.0001) was significant. Finally, the cell apoptosis rate was raised [Figure 5]c and [Figure 5]d (P < 0.01) at 72 h in circ-ARHGAP26 (-) group, suggesting that circ-ARHGAP26 downregulation inhibited cell proliferation and enhanced cell apoptosis in AGS cells. In this study, we found that circ-ARHGAP26 expression was elevated in GC cell lines compared to normal gastric epithelial cells. More importantly, circ-ARHGAP26 downregulation inhibited cell proliferation and promoted cell apoptosis in HGC-27 cells as well as in AGS cells. circRNAs is a type of noncoding RNAs formed by a covalently closed loop, which have a remarkable characteristic of noncanonical splicing without a free 3′ or 5′ end.,,,, For decades, circRNAs are misread into splicing errors resulting from splicing artifacts or gene rearrangements, while they are found to be common in mammalian cells and re-recognized from RNA sequencing data until recently (from 2012 to 2013), which present with conservative properties, high stability as well as various biological functions, including: (1) sponge for miRNA; (2) transcriptional regulation; (3) interaction with RNA-binding proteins.,,,,,,,,,,, As to the role of circRNAs in the pathogenesis of GC, only a few recent studies have been reported., For instance, ciRS-7 presents high expression in GC cells, and its over expression enhances PTEN/PI3K/AKT pathway through inhibiting miR-7, thereby promoting cell proliferation, migration and cell invasion in GC. Another previous experiment reveals that circPVT1 is observed to be over expressed in GC tissues, and it enhances GC cell proliferation through acting as the sponge for miR-125 family. Hence, these previous data indicate that dysregulated circRNAs may play a critical role in the etiology of GC. circ-ARHGAP26, as one of the tumor-related circRNAs, is initially detected by a circRNA microarray analysis and were found to be upregulated in GC tissues compared to paired adjacent normal tissues in a previous study. However, in another study conducted by Xie et al., circ-ARHGAP26 level is greatly decreased in both GC tissues and GC cell lines, moreover, its downregulation correlates with presence of lymphatic metastasis in GC. The conflictive results in these two previous studies indicate that the function of circ-ARHGAP26 in GC is still obscure. Furthermore, the regulatory effects of circ-ARHGAP26 on GC cells have not been explored in previous studies. In this study, we performed qPCR, CCK-8 and AV/PI assays to explore the expression of circ-ARHGAP26 in GC cells as well as its underlying mechanism in regulating GC cell proliferation and apoptosis. We found that circ-ARHGAP26 expression was raised in GC cell lines compared with normal gastric epithelial cell line, and its downregulation inhibited cell proliferation and promoted cell apoptosis in HGC-27 cells and AGS cells. The possible reason might be that circ-ARHGAP26 affects cell proliferation and cell apoptosis through regulating several target cancer-related miRNAs, such as miR-1205, miR-135-5p, miR-17-3p, miR-2115-5p and miR-3120-5p that are predicted according to the Potential Binding MicroRNAs (PBM) analysis in TSCD on gb.whu.edu.cn/TSCD, thereby promoting the tumorigenesis in GC. However, this explanation needs further validation. In addition, our results suggested that circ-ARHGAP26 might be served as a potential oncogene through affecting cell proliferation and cell apoptosis in GC, which might shed light on application of circ-ARHGAP26 as a potential treatment target for GC. In conclusion, circ-ARHGAP26 is over-expressed, and its downregulation inhibits cell proliferation and promotes cell apoptosis in GC cells. Carlomagno N, Incollingo P, Tammaro V, Peluso G, Rupealta N, Chiacchio G, et al. Diagnostic, predictive, prognostic, and therapeutic molecular biomarkers in third millennium: A breakthrough in gastric cancer. Biomed Res Int 2017;2017:7869802. Hartgrink HH, Jansen EP, van Grieken NC, van de Velde CJ. Gastric cancer. Lancet 2009;374:477-90. Gonzalez CA, Agudo A. Carcinogenesis, prevention and early detection of gastric cancer: Where we are and where we should go. Int J Cancer 2012;130:745-53. Cappellani A, Zanghi A, Di Vita M, Zanet E, Veroux P, Cacopardo B, et al. Clinical and biological markers in gastric cancer: Update and perspectives. Front Biosci 2010;2:403-12. Ashraf N, Hoffe S, Kim R. Adjuvant treatment for gastric cancer: Chemotherapy versus radiation. Oncologist 2013;18:1013-21. Van Cutsem E, Sagaert X, Topal B, Haustermans K, Prenen H. Gastric cancer. Lancet 2016;388:2654-64. Li P, Chen S, Chen H, Mo X, Li T, Shao Y, et al. Using circular RNA as a novel type of biomarker in the screening of gastric cancer. Clin Chim Acta 2015;444:132-6. Hansen TB, Jensen TI, Clausen BH, Bramsen JB, Finsen B, Damgaard CK, et al. Natural RNA circles function as efficient microRNA sponges. Nature 2013;495:384-8. Doherty GJ, Ahlund MK, Howes MT, Moren B, Parton RG, McMahon HT, et al. The endocytic protein GRAF1 is directed to cell-matrix adhesion sites and regulates cell spreading. Mol Biol Cell 2011;22:4380-9. Xie Y, Shao Y, Sun W, Ye G, Zhang X, Xiao B, et al. Downregulated expression of hsa_circ_0074362 in gastric cancer and its potential diagnostic values. Biomark Med 2018;12:11-20. Shao Y, Li J, Lu R, Li T, Yang Y, Xiao B, et al. Global circular RNA expression profile of human gastric cancer and its clinical significance. Cancer Med 2017;6:1173-80. Memczak S, Jens M, Elefsinioti A, Torti F, Krueger J, Rybak A, et al. Circular RNAs are a large class of animal RNAs with regulatory potency. Nature 2013;495:333-8. Qu S, Yang X, Li X, Wang J, Gao Y, Shang R, et al. Circular RNA: A new star of noncoding RNAs. Cancer Lett 2015;365:141-8. Cui X, Wang J, Guo Z, Li M, Li M, Liu S, et al. Emerging function and potential diagnostic value of circular RNAs in cancer. Mol Cancer 2018;17:123. Qian L, Yu S, Chen Z, Meng Z, Huang S, Wang P. The emerging role of circRNAs and their clinical significance in human cancers. Biochim Biophys Acta Rev Cancer 2018;1870:247-60. Xie Y, Li T, Mo X, Guo J. [Circular RNAs and their roles in tumorigenesis]. Sheng Wu Gong Cheng Xue Bao 2016;32:1507-18. Du WW, Yang W, Liu E, Yang Z, Dhaliwal P, Yang BB. Foxo3 circular RNA retards cell cycle progression via forming ternary complexes with p21 and CDK2. Nucleic Acids Res 2016;44:2846-58. Nigro JM, Cho KR, Fearon ER, Kern SE, Ruppert JM, Oliner JD, et al. Scrambled exons. Cell 1991;64:607-13. Wan L, Zhang L, Fan K, Cheng ZX, Sun QC, Wang JJ. Circular RNA-ITCH Suppresses lung cancer proliferation via inhibiting the Wnt/beta-Catenin pathway. Biomed Res Int 2016;2016:1579490. Salzman J, Gawad C, Wang PL, Lacayo N, Brown PO. Circular RNAs are the predominant transcript isoform from hundreds of human genes in diverse cell types. PloS One 2012;7:e30733. Belousova EA, Filipenko ML, Kushlinskii NE. Circular RNA: New regulatory molecules. Bull Exp Biol Med 2018;164:803-15. Haque S, Harries LW. Circular RNAs (circRNAs) in health and disease. Genes 2017;8. Chen J, Li Y, Zheng Q, Bao C, He J, Chen B, et al. Circular RNA profile identifies circPVT1 as a proliferative factor and prognostic marker in gastric cancer. Cancer Lett 2017;388:208-19. Pan H, Li T, Jiang Y, Pan C, Ding Y, Huang Z, et al. Overexpression of circular RNA ciRS-7 abrogates the tumor suppressive effect of miR-7 on gastric cancer via PTEN/PI3K/AKT signaling pathway. J Cell Biochem 2018;119:440-6.